The time management matrix will help you identify what you really spend your time on. It's a particularly useful tool if you want to know how to prioritize work, personal roles, goals and commitments. 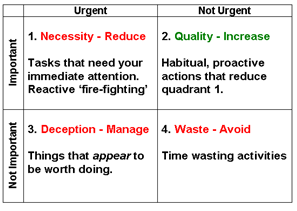 Made popular by the late Stephen R. Covey, it's based on the the idea that all your time is spent in a four quadrant matrix. You can't change the size of this matrix -- that's the time that you have. You can significantly alter the size of the four quadrants within the time matrix. One useful way to evaluate what matters is explained in the Pickle Jar theory. Examples include maintaining and building relationships, regular exercise, healthy eating or learning new skills.. The Quadrant of Deception - plenty of people have gone home in the evening wondering where all the time went. Well, it was here! It's so easy to get sucked into doing things that are the wrong side of the 80-20 rule. Many meetings, popular activities and easy tasks are probably a waste of your time. Some of the worst culprits? Other people! What are you like at managing interruptions? The Quadrant of Waste - you know what it is and you know when you've been in it. The trick is to know when you're in it. Often, it starts out as restful time (which is Quadrant 2). The tipping point comes when you spend too long doing mindless things. The best judge of which quadrant you are in is you. As your awareness improves, you enhance your ability to choose how to spend your time. Learn some simple but powerful types of decision making techniques to help you do this. Use the time management matrix to help you do more of what matters. The Secret of Time Management? Don't Do It Now!